WE, YOUR COMMITTEE ON MEMORIALS BEG TO SUBMIT OUR REPORT IN LOVING MEMORY OF OUR DEAR DECEASED MEMBERS WHO HAVE BEEN CALLED AWAY SINCE OUR LAST SESSION. …SISTER LEALA MIKELL WAS BORN SEPT. 14, 1891, MARRIED BROTHER O.W. MIKELL MARCH 7, 1909, UNITED WITH OLIVE LEAF CHURCH SEPT. 1911, CAME TO NEW RAMAH CHURCH BY LETTER FEB. 12, 1916, DEPARTED THIS LIFE FEB 14, 1975. IT IS WITH MUCH SADNESS THAT WE RECORD THESE MEMORIALS, BUT WE SAY TO ALL THAT MOURN THEIR PASSING, WE SHARE IN YOUR LOSS, BUT WE BELIEVE THAT OUR LOSS IS THEIR ETERNAL GAIN, OUR PRAYERS THAT GOD’S RICHEST BLESSINGS WILL FILL THE EMPTINESS THAT IS LEFT BY THEIR ABSENCE. Anne Leola “Ola” Crews was born in Clinch County, GA on September 14, 1891, the eldest child of Perry Crews and Rhoda Guthrie. She appeared with her family in the Census of 1900 in the Mud Creek district of Clinch County. Her father was working a rented farm there. In 1909, Ola Crews married Otis Willie Mikell in Clinch County. Born April 8, 1885 in Berrien County, he was a tall and slender young man, with dark hair and blue eyes. His mother was Rebecca Lee (1845-1932). 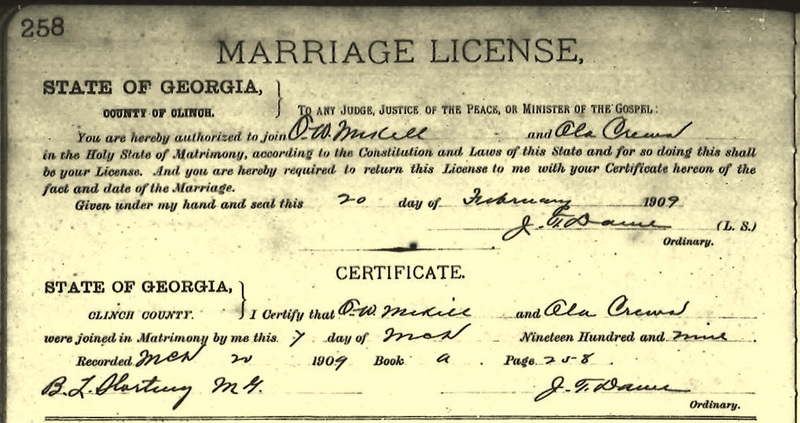 His father, John A. Mikell (1848-1889), served terms as Justice of the Peace, Road commissioner, and Deputy Sheriff in Clinch County, GA.
Otis Mikell and Ola Crews marriage certificate. While the Clinch County marriage license clearly shows that O.W. Mikell and Ola Crews were joined in matrimony on March 7, 1909, census records from this period are confusing. On the one hand, it appears that Ola continued to live with her mother for some time after her marriage. In the 1910 census of of the Mud Creek district, Ola Crews was enumerated on April 19 in her widowed mother’s household, under her maiden name, as a single female. Her mother, Rhoda Crews, was head-of-household, a farmer, working her land on her own account. On the other hand, the census of Militia District 1280 in Clinch County, enumerated in May, 1910 shows O.W. Mikell as head of household with his wife, Ola Mikell, married one year. Otis and Ola were renting a house on the farm owned by his mother. Otis’ brother, George Calhoun Mikell, and his family were renting the house next door. Ola and Otis Mikell were members of the Primitive Baptist faith. Church records show that Ola Mikell united with Olive Leaf Primitive Baptist Church near Dupont, GA in September, 1911. Some time before 1916, Otis and Ola moved to Ray City, GA. On February 12, 1916 Ola joined with New Ramah Church at Ray City by letter. The WWI draft registration records show Otis worked as a farmer at M.C. Lee’s place. In the Census of 1920, Otis W. Mikell was renting a farm on a settlement road near Ray City. By this time, the Otis and Ola’s household included their five children: Annie C., Alvin L., Cleo, and the twins Clementine and Pauline. Also in the Mikell home was Otis’ brother, Augustus. Farming next door was John Troutman from Bavaria, Germany, and boarding with him was the Primitive Baptist preacher, Alfred F. Fender. In the 1930s, Otis and Ola were renting a farm and raising their children in the Lois district, near Ray City. Otis Mikell died February 19, 1958. 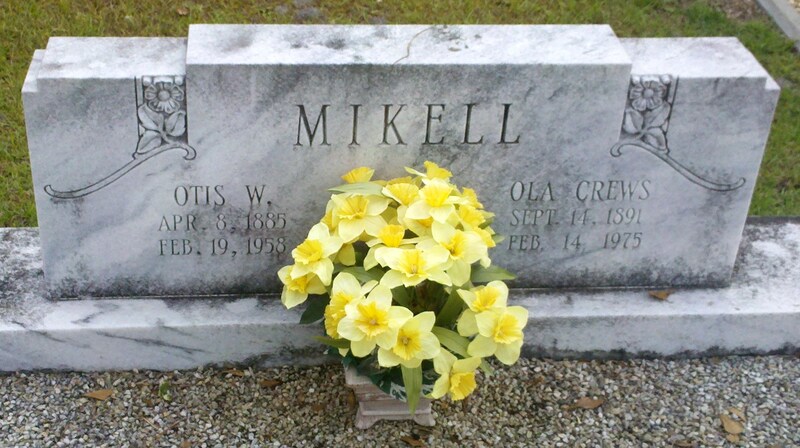 Ola Crews Mikell died Feb 14, 1975. They are both buried at New Ramah Cemetery in Ray City, along with others of the Mikell family connection. A recent document discovery at Ray City Community Library, Ray City, GA was the minutes of the 1962 Union Primitive Baptist Association. The settlers of the Wiregrass in Lowndes and Berrien county, Georgia were predominantly of the Primitive Baptist faith. Union Church (aka Burnt Church) on the Alapaha River served the families of early settlers like William A. Knight and his son Levi J. Knight. Primitive Baptist churches became a part of many communities. In 1913, the Knight descendants built New Ramah Primitive Baptist church at Ray City. Cassie Lee Hall, Arrin Horn Guthrie, Effie Shaw Clements, Alfred F. Fender, Minnie Clements Sirmans, Aden Boyd, Elizabeth Skinner Register.